joy magnetism: Tastes great, less...wait, really? Ok. I just caught up on seven episodes of Mad Men. I know, I know - I'm usually pretty good when it's a show I really love, not just trying to get off my DVR. But I knew I'd want to concentrate while catching up. And now I know about that John Deere episode that I've been la-la-la-ing with my fingers in my ears. In a word, ewwwww. But, yay for being caught up. And so I'd celebrate with this odd little ad magnet that I picked up at the cool Museum of Brands in London that I mentioned a while ago. I picked it up because at night in London, off in the distance, you can see the giant well-lit letters of the OXO Wharf Tower on London's Southbank. It's had an interesting history, first as a power station, then as a cold storage center for OXO products, and finally, it's been rehabbed into a neat shopping/residential area. I didn't get to visit, but I did just learn that the letters aren't all neon-y, like regular building signs. The giant OXO are actually made out of windows, that are just lit through at night. How cool. 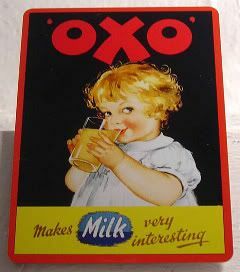 But, I also didn't understand the thing about OXO that "makes milk interesting." So I just looked it up. Classic ad, selling something that you just can't believe. OXO beef products. Apparently, they were suggesting that you mix these beef cubes...with milk. Uhhh, beef-flavored...milk? Mind you, you're reading this blogpost from the chick who, at the age of 5, hid behind the counter to mix together milk and Pepsi like Laverne always used to do on Laverne & Shirley. But, dang. I have my limits.